For the first six the letters stand for the following: B: Brackets, P: Parentheses (essentially the same thing) I: Indices, E: Exponents, O: Orders (Again, the same in essence), D: Division, M: Multiplication (Inverse operations) A: Addition, S:Subtraction (Again inverses). There is a massive problem with these mnemonics, and their use in teaching. I do, however, think it’s down to the teaching rather than the mnemonics themselves, and possibly down to a lack of understanding from some who teach it. 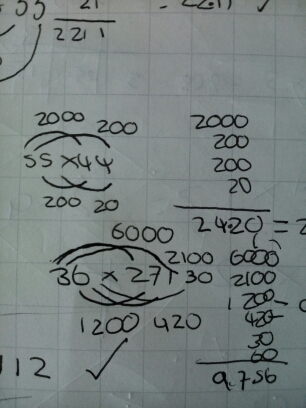 And example of the problem I’m hinting at occurred on Friday with my top set year 8 class. As part of a ten quick questions core skills starter I included the question: 3 – 1 + 2 = . A problem free, easy, question for a class working at level 6-8 one would think, but the uproar when going through the answer was unbelievable. I asked one lad what he had written, he told me zero, I asked if anyone could tell me what he’d done wrong and was met first with blank stares, then with “Sir, it is zero. Have you forgotten about BIDMAS”. The scale of the misconception was enormous. After the first person said it the entire class were up in agreement. I settled them down, jettisoned that days lesson plan and retaught them the order of operations, but properly. With the R standing for roots, as this shows the inverse relation for that level too. The year 8 class now understand the order of operations, despite protests that “(insert name of former colleague here) told us addition ALWAYS comes before Subtraction!” as they all thought this, it is possible. I’ve seen it taught wrong in more that 1 school. I had a real row with another trainee on my PCGE course in a microteaching session when she taught it wrong and tried to say I was wrong. Every year the pupils from one of the feeder primaries get it wrong, so I think their yr6 teacher must teach it wrong. I’ve also been brought in to settle arguments on social media networks that have erupted over those stupid viral questions based around this. All this shows that there is a perpetuation of this misconception in this country, and we need to stamp it out. Hello, and welcome to the 75th issue of the Math(s) Teachers at Play Blog Carvinal! For those of you who are unaware, a “blog carnival” is a periodic post that travels from blog to blog and has a collection of posts on a certain topic. This is one of two Maths Carnivals, the other being the Carnival of Mathematics, the current edition can be found here. 75, 75, 75 – What is there to say about the number 75? It is a nice round integer, forming three quarters of 100. It is the 4th “Ordered Bell Number“, and more impressively is a “Keith Number“. It is the amount of uniform polyhedral that exist (when coinciding edges are excluded), it is the atomic number of rhenium, the age limit for Canadian senators and , perhaps most impressively, has only two distinct prime factors, and they are the two lowest odd primes! This is the first time I’ve hosted a carnival and there were some excellent submissions. I enjoyed reading them all and have discovered some new blogs. I have also input some posts I’ve seen this month which I thought were excellent too. Crystal Wagner in this post discusses some ideas for teaching maths to those under 6. She urges us not to rush into formal academics programmes, but to spend more time exploring the subject. This post from Pradeep Kumar discusses finger counting and suggests methods to help children move on from it. Margo Gentile give us a nice little activity for those first learning their times tables. Lisa Swaboda asks “Do vegetables have OCD?” – This is a nice post that looks at the symmetry in the world around us and asks philosophical questions about its nature. Yelena at Mobius Noodles asks “What maths do you have in your house?” and tells us about the maths house she created at the mini maker faire. Dave Gale discusses percentages, and helps me feel sane by proving I’m not the only one who sees maths everywhere. Penny Ryder has written this piece about fractions, and how they can be explored using 21st century technology. Interesting stuff for those with access to iPads. Bryan Anderson gives us a fantastic arty maths project that uses DESMOS. And I discuss a further maths lesson which degenerated into a lengthy exploration of Pythagorean Triples! In this post , my star post of the carnival, Christopher Danielson explores the purpose of posing mathematical questions, and gives us all food for thought on the way we question children. This nice post from fMaths discusses marking in maths. You can follow Craig Barton and his team as they voyage through the journey of writing a new Scheme of Work. Festival Founder Denise Gaskins has written a post talking about the brand new book, Playing with Math edited by Sue Van Huttam! There is a suberb episode of Wrong, but useful. while one of the hosts, Colin Beveridge, tells us why he loves maths, and I join in the love in. If anyone else has written, or would like to write, a post on why they love maths, I’d love to read them! A while ago I read this post entitled “Would I recommend teaching?”, It was an enjoyable post, some things I agreed with and some I didn’t, but the overarching answer I would give to the question is a definitive yes. Then yesterday I happened across this article on buzz feed which I thought put some much needed positivity about the profession in to the public domain. What followed was a torrent of tweets about “What about 60 hour weeks? What about the near constant riot control? What about paperwork? What about overbearing SLT? What about the politicians interfering when they don’t have a clue about what happens in the classroom? It’s a thankless task.” I was left with the weird feeling that I was somehow being attacked for enjoying the job I do. I was left with a similar feeling last week when a careers advisor spoke at assembly. He was talking about a website where pupils could look up careers and see if they were for them. He said he often found teachers on there and that he could see some nodding. Both the assembly and twitter irked me a little. Yesterday I wanted to respond, but 140 characters is nowhere near enough for me to say all the things I want to say. What about 60 hour weeks? What about them? I regularly work 50/60 hours a week, I have managed to reach a point where all of those hours take place in school and I have evenings and weekends to spend time with my family. On top of this I have 13 weeks a year holiday time, again to spend with my family, and I feel this is adequate compensation for the hours spent working during term time. We’ve all had those classes, they can be hell, at times. But the satisfaction you feel when you make it through the “pushing the barriers” phase and earn the respect of those classes, in my opinion, more than makes up for the start. I work in a tough school, a very tough school. A school with a much higher than average pupil premium intake, a school heavily weighted towards lower and middle band FFT pupils, a school with some very tough classes. Even here, it’s not “Riot Control” on the whole. There isn’t that much, and what there is is generally necessary. If you are dealing with vulnerable pupils, with child protection issues. You need to make sure that things are logged and that you have the required documents to pass on to the appropriate outside agencies. There is also the unfortunate aspect of covering your back, which is made necessary by the “out for what you can get” lawsuit culture which seems to have crept across the Atlantic over the last 20 years or so. There is a lot of paperwork for NQTs, but we want to make sure the people who are teaching the next generation are capable of it don’t we? I have no personal experience of this, but I have seen what this can do to friends and family members in schools where this has happened. I imagine that perhaps sometimes the people complaining about the paperwork actually fit better into this category. My advice would be to find a new job and move on. Its not like that everywhere. What about the politicians interfering when they don’t have a clue about what happens in the classroom? I can understand this argument. I really can. But education is something that must be run by politicians. The only other choice is to hand it over to the private sector and allow a race to the bottom. Keir Hardie, and others like him, fought for a state education, to bring education to those who couldn’t afford it, and I baulk at the thought of taking that freedom away. The way democracies work are that the populous votes in a government whom are then entrusted with making these decisions, to remove that would be to remove democracy. Is it? Perhaps I’m doing it wrong then. This week my year 11s and my year 13s finished their terminal external exams. It’s been quite an emotional time. I have received tons of thank you notes and cards. I received one from the parent of a year 11 pupil who thanked me for “inspiring” her daughter and giving her a “confidence with maths that she never has had before.” A year 13 thanked me for “reaffirming my faith in maths” and “inspiring me to go into maths teaching”, saying he hoped he could be “half as good a teacher as you are.” Another year 13 thanked me for “giving me confidence in my own ability, I wouldn’t have got through my a levels without you.” I was also thanked for being a great shoulder to cry on and told by a group of year 13s that they would really miss me. I will really miss them. This isn’t a thankless task. I could list more examples, but this is starting to make me feel like I’m blowing my own trumpet a bit. I will say this though, have been thanked more as a teacher than in any of the many previous jobs I had before. Thanks that comes from pupils, parents, colleagues and mangers. Thanks that means a lot. The wider life of the school also offers more than any other job I’ve ever had. Yesterday at 4:30 I sat in the school hall to watch an hour long performance from a group of sixth formers. It was brilliant. They were brilliant. I was moved by the performance. This isn’t the only time I’ve been moved by a school performance and I’m sure it won’t be the last. I love plays and musicals and some of the ones I’ve seen here have been as good, if not better, than professional performances I’ve been to. Its amazing and I am always so proud of my pupils.On top of that, I’ve been lucky enough t play in the staff band. This is great fun, both jamming after school an playing in assemblies. Then there’s the rugby teams. I’ve not had time to help with the coaching this year, but I’ve been able to catch a few games and in a few weeks I will be going to see some f our year 7 and year 8 pupils represent South Leeds Schools on the hallowed turf of Headingley Carnegie Stadium. Yes, yes I would. Without a shadow of a doubt. I love it, every minute of it. I don’t understand why anyone wouldn’t. But I do understand that not everybody does love it. If you are a teacher and not enjoying it you need to ask why. Perhaps it is teaching you don’t enjoy, in which case get out, find something you do enjoy. If not, perhaps its the school, look around and try somewhere else. Don’t try to insinuate that there’s something wrong with me because I like it. Teaching is hard, very hard. Especially the NQT year, but in my opinion it is well worth the effort. I would definitely recommend it, but with I would give this warning: Don’t go into teaching if you want an easy ride, if your planning on slacking off, or if you haven’t got a thick skin. A while ago I wrote this post about multiplication. In it I explored a few different ways of multiplying and what I felt worked best and why. I covered the main ones, and I realise there are many different methods. I looked at it and thought, “bizarre”. I asked the girl in question who taught her it and she said she’d didn’t know, but that it made sense to her but grid and column methods don’t. I like the method, it reminds me of expanding a pair of binomial brackets, but it the numbers were 19 + 4 etc. It’s fantastic for 2 digit by 2 digital or 2 digit by 3 digit and I think it shows the distributive property quite well. There are major limitations though. It looks really neat in these two examples, but the questions that were 3 digit by 3 digit were a little spaghetti like and the ones with 4 digits were totally illegible. Have you seen this method before? Do you like it? I’d love to know! Recently Tom Sherrington (@headguruteacher) wrote this post which sets out a rather bizarre chain of events that occurred after he wrote a review of Daisy Christodoulou’s (@daisychristo) “Seven Myths about education“. I won’t recount the events here, if you are interested read Tom’s post, and I won’t discuss the book or the review as I am yet to read said book. It’s on my list, I’m very much looking forward to it and I’m sure I will write about it once I’ve read it. 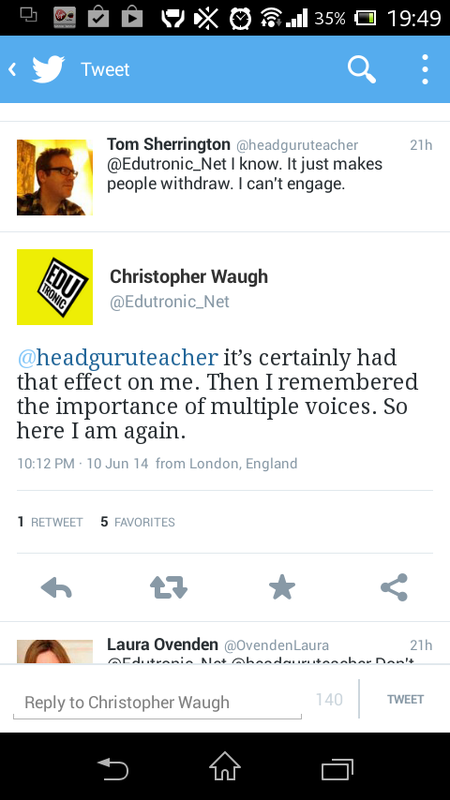 And this really got me thinking on the whole subject of twitter, blogging and educational research. Around 18 months ago I was having a conversation about Twitter as CPD with Mark Miller (@GoldfishBowlMM). During the conversation I mentioned I had unfollowed some people because I felt they held views that were diametrically opposed to mine. Mark responded by saying he had thought about doing the same, but had decided to keep following those people. His reasoning was that if you only followed “like minded people” than you were only hearing opinions that reinforce what you believe already and you never test or develop those ideas as they are never challenged. I re followed said people. This idea of testing and challenging ideas is an important one. Tom Sherrington said at Northern Rocks that if there was no one in his new school challenging his policies and ideas he would appoint someone as a challenger to do just that. We all need to be challenging, where appropriate, things that are put in front of us, but we also all need to be challenging our own ideas. When I’m researching assignments I find it very easy to find sources that agree with me and use them to pick holes in ones that don’t, but since that conversation with Mark I’ve made a marked effort not to do that. I’ve even ended up changing opinions on some things, and I think that’s healthy. We all need to be in a position where we can accept we’re wrong when we are presented with the evidence. Debate is a good thing. It was testament to the organisers of both Northern Rocks and ResearchEd York that speakers from both ends of the spectrum were they. The organisers wanted to promote debate, not shut it down. They wanted to help people challenge what’s put in front of them and challenge what they think. We need to be constantly challenging everything. That’s how we grow, how we evolve our practice, refining it. Keeping what works and rejecting what doesn’t. It’s also how we grow as people, and is a mindset we should be instilling in our pupils and our own children. “I don’t necessarily want you to think like me, I just want you to think” Tait Coles (@totallywired77), Northern Rocks, 7th June 2014. Today was the “Northern Rocks: Reclaiming Pedagogy” event at Leeds Met Headingley Campus, #Nrocks. The event was organised by Emma Ann Hardy (@emmaannhardy) and Debra Kidd (@debrakidd), and like Nten-researched-york, had a mass of fantastic speakers running workshops. So much so I had terrible trouble selecting some of the workshops, and I cannot wait to catch some of those I missed online! (I believe they were all taped and will be available). The event started with a panel discussion, chaired by event host Debra Dimbleby. The panel was: Mick Waters, a professor and former Chief Education Officer; Ian Mearns MP for Gateshead (@IanMearnsMP); Dominic Cummings, former policy advisor for Gove; Kevin Courtney (@cyclingkev) of the NUT; Richard Gardner of the Independent and Dot Lepkowska another journalist. The discussion was at times really interesting and focused around Ofsted, Policy and Performance Related Pay. For the first workshop I chose to see Prof Coe, the theme was research and he looked at various strands of research and it’s findings. He also loomed at the impact in schools, and the impact he’d like to see. He covered a lot in the time and I left the session with a long list of further reading I’m looking forward to getting into when I find some time. Tom’s presentation included some fantastic examples of the research based initiatives going on at KEGS and how they shared them. He’s written previously on the subject here. He spoke of creating a professional culture in the school where staff are striving to develop and are thoroughly engaged in driving their own CPD. He also spoke of getting the basics right. Talking about the progressive vs traditionalist debate he quipped that there’s no point arguing about the benefits, or not, of thinking hats if the behaviour is stopping the class from learning. 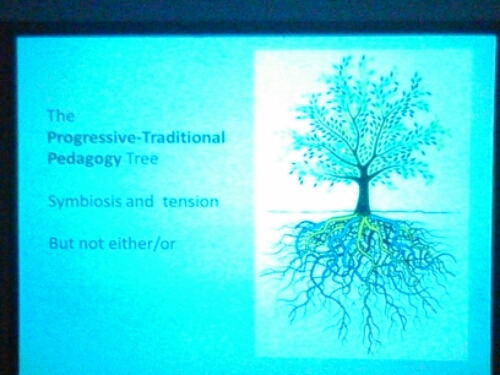 On the traditional progressive debate, he referred to it as a symbiotic relationship, like a tree, believing parts from both to be important. You can see Tom’s presentation, complete with links to relevant blog posts, here. Next up was the Punk Learner himself, who welcomed us into the room with The Fall’s “Hit the north”. When browsing the programme I saw that Tait’s session was around inequality in education, and as this is something extremely close to my heart I opted for this session over a few others in the timeslot I would also have liked to see. Tait’s presentation was almost like a call to arms. Setting out his feelings around the inequality in the system and why he feels the system is broken. A lot of the things he mentioned are things I’m currently investigating for a masters assignment and I picked up some good references. The questions section at the end was also brilliant and included a lively debate on cultural capital and the role of schools. I have plenty to say on that too, but that’s another post for another day. For the final workshop I chose John Tomsett. There were many others I would have loved to see in this slot, but John is another of my favourite bloggers, having seen him do the keynote at Nten-researched-york I was worried it might be the sane talk, but the title was such that it seemed different, and it was. John’s session was, in many ways, similar to Tom Sherrington’s. They both left me feeling that they would be great to work for, that their schools would be great to work in, that CPD and PM should be highly personalised, non-judgemental and intrinsically linked. They both mentioned they had more than average INSET days, and that they cared about creating a growth culture for staff and students alike. John then spoke about his own teaching. He expressed his strong view that the headteacher in a school should be the HEAD teacher in that school. He then showed some videos he’d used to identify and improve his own teaching. Showing that even experienced heads can grow. He spoke deeply, openly and honestly about his own journey, gave me a ton of books I now need to read and got me excited about his own book! 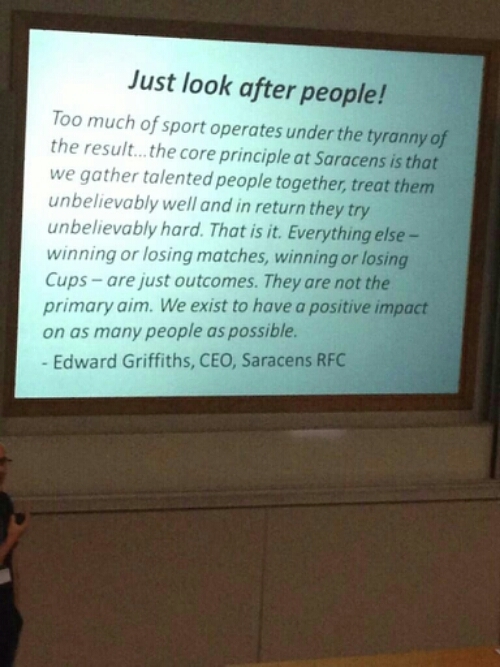 Sharing the Saracens philosophy, which is to get the best players, develop them and keep them happy. He applies this philosophy to Huntingdon and sees similar rewards. The final session was led by Hywel Roberts and Mike Waters. 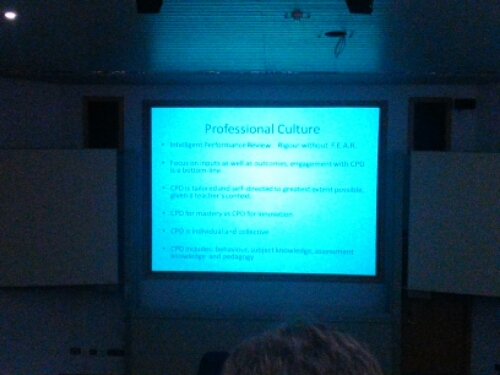 They spoke about the 4 key themes of the day: Policy, Pedagogy, Professional Development and Research. Their session was funny, thought provoking and entertaining, and included opportunities to discuss the day with others. All in all, the day was fantastic. I thoroughly enjoyed it and have gathered knew info and ideas which will help in the classroom, in my studies and in the future. This write up has been done without my notes, so apologies if I’ve confused anything. This is just my views as they stand. There are many strands of discussion from today I hope to discuss further in future blogs.